What does Walther say about the Preaching Office? 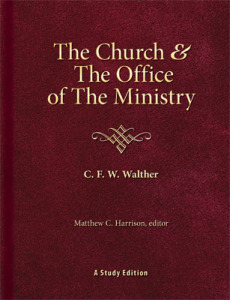 As the subtitle of the original German edition states, The Church and The Office of The Ministry is “a collection of testimonies . . . from the Confessions of the Evangelical Lutheran Church and from the private writings of orthodox teachers of the same.” Professional church workers and interested lay members will find a wealth of insights from the Bible, the Confessions, ancient church fathers, Luther, the orthodox Lutheran fathers, and more on the key questions of what or who is the Church, what is and who holds the Office of the Ministry, and what are the powers and duties of each. 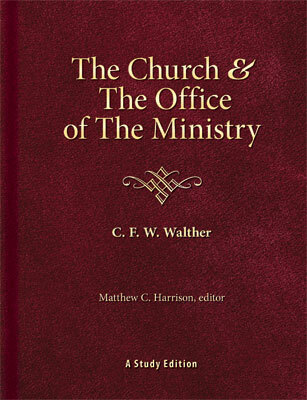 As we approach the commemoration of Pastor C. F. W. Walther on May 7, we offer the following excerpt from his writings on the preaching office. A. To the preaching office there is due respect as well as unconditional obedience when the preacher uses God’s Word. “The one who hears you hears Me, and the one who rejects you rejects Me, and the one who rejects Me rejects Him who sent Me” (Luke 10:16). “We ask you, brothers, to respect those who labor among you and are over you in the Lord and admonish you, and to esteem them very highly in love because of their work. Be at peace among yourselves” (1 Thessalonians 5:12–13). “Let the presbyters who rule well be considered worthy of double honor, especially those who labor in the Word and doctrine. For the Scripture says, ‘You shall not muzzle an ox when it treads out the grain’ and ‘The laborer deserves his wages.’ Receive no complaint against a presbyter without two or three witnesses” (1 Timothy 5:17–19; cf. Galatians 6:6–10). “As you enter the house, greet it. And if the house is worthy, let your peace come upon it, but if it is not worthy, let your peace return to you. And if anyone will not receive you or listen to your words, shake off the dust from your feet when you leave that house or town. Truly, I say to you, it will be more bearable on the day of judgment for the land of Sodom and Gomorrah than for that town” (Matthew 10:12–15). . . .
From The Church and The Office of The Ministry, pages 300–02 © 2012 Concordia Publishing House. All rights reserved. 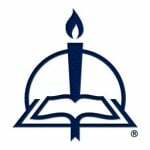 To order The Church and The Office of The Ministry, please contact CPH at 800-325-3040 or visit www.cph.org.